Advanced training in non-surgical methods for back pain cause people to travel to see this Portland, OR chiropractic physician. Learning certain movement patterns from a “back whisperer” like Dr. Snell reduces re-injury and helps with resorption of the disc material to accelerate the healing process. A trending recent Vox News Service article by Julia Belluz, A Comprehensive Guide to the New Science of Treating Lower Back Pain, not only discussed current non-surgical and non-opioid treatments for back pain, but also coined a term new to many...the "Back Whisperer." “Back Whisperer” refers to a conservative (non-surgical) spine specialist that has advanced training in a variety of different methods to help manage back pain…especially those related to disc injury in the lumbar spine. 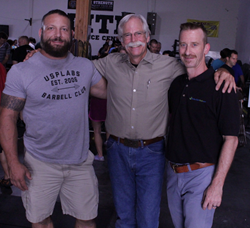 Dr. Phillip Snell in Portland first heard of the original "back whisperer," Dr. Stuart McGill, in 2002 after he was sidelined by a disc injury himself. His dissatisfaction with the disparate messages he received about treatments forced the “physician to heal himself”. His combing of the research was particularly fruitful in the body of work generated by Dr. McGill. Dr. Snell traveled to study directly with Dr. McGill and even sponsored him to Portland to teach his other colleagues about his research. A “back whisperer” uses movement as a major part of the prescription for patients with back pain. Those movements and exercises may vary greatly for different patients but tend to follow a specific path. Dr. Snell has used that path of care to help thousands in his clinic in Portland and all over the world on his self-help website FixYourOwnBack.com. MYTH: The only way to treat a disc herniation is with surgery. FACT: Studies show that when patients that receive surgery for lumbar disc herniation are compared to those that use methods like those shown on FixYourOwnBack or that Dr. Snell uses in his clinical practice, after 1 year the improvement is the same in both groups. MYTH: Once injured, a disc doesn’t heal. FACT: Studies show that even extruded disc material is resorbed by the body in the vast majority of cases. Learning certain movement patterns from a “back whisperer” like Dr. Snell reduces re-injury and helps with resorption of the disc material to accelerate the healing process. MYTH: Strong pain medication like opiates are the only way to control the pain. FACT: Opioids are dangerous narcotic medicines that can cause dependency. Their over-prescription for back pain has been one of the primary causes for the spike in over-dose related deaths in the US. In 2015, prescription opioid overdose caused 33,000 deaths in the US alone. For those living in the Portland area, Dr. Snell and his team can spend one-on-one time with back pain patients by calling this number, 503-235-5484. For those for whom Portland is too far away, the online version of Dr. Snell’s “back whisperer” approach is available to Premium Subscribers at FixYourOwnBack.com.